Mark Froemke is a Minnesota/North Dakota Communist Party USA member and is president of the Western Area Labor Council (AFL-CIO), which represents union members in 11 North Dakota counties and 7 Minnesota counties. Froemke represents the Bakery, Confectionery, Tobacco and Grain Millers Union, AFL-CIO. He spent 22 years in the sugarbeet industry in the factory in East Grant Forks, Minnesota. Mark Froemke and his wife LaVonne are both active in the Democratic-Farmer-Labor Party, the Minnesota affiliate of the Democratic Party. Froemke has relationships to nearly all Minnesota’s leading DFL politicians, including the state’s Governor, Secretary of State and both of Minnesota’s DFL Senators. 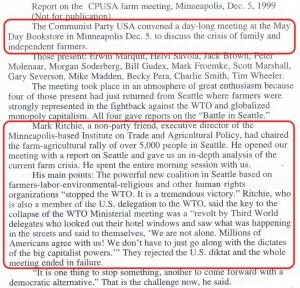 In 1999, Froemke attended a Communist Party meeting in Minneapolis, with none other than Mark Ritchie, now Minnesota’s Secretary of State. In 2006, four leaders of the Minnesota/Dakota’s Communist Party USA – Mark Froemke, Doris Marquit, Erwin Marquit and Peter Molenaar were listed as supporters of the Mark Ritchie Minnesota Secretary of State campaign. It was Mark Ritchie of course, as Minnesota Secretary of State, who awarded one of Minnesota’s two Senate seats to leftist comedian Al Franken, in a very tight recount after the 2008 election. Whether Minnesota labor’s massive effort to mobilize members in the 2008 elections was a success will ultimately turn on the results of a recount in the U.S. Senate race, Labor 2008 coordinators say. Independence Party candidates made the difference in the Bachmann and Paulsen races and definitely affected the Senate race, said Mark Froemke, president of the West Area Labor Council that spans the western half of the state. ‘The Independence Party got a better number than I would have expected in this area,’ he said. Negativity of campaign commercials in the final days of the Senate race also had an effect. “Minnesotans need a senator who understands the needs of Minnesota families, and who won’t abandon them in a time of need,” declared Mark Froemke, education director of the Bakery, Confectionary, Tobacco Workers and Grain Millers Union, Local 167G. “Norm Coleman had a chance to support the families of the Red River Valley on CAFTA and, instead, he supported President Bush,” Froemke noted. “Al Franken will stand with farmers and workers and Minnesotans, and that’s why we stand with him in this election. Froemke still works closely with Franken. 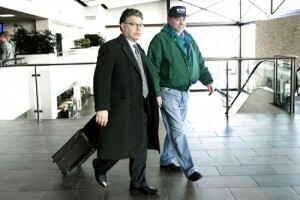 In the photo below, Al Franken, left, and Mark Froemke, an AFL-CIO representative, leave the Grand Forks International Airport on Tuesday January 11, 2012, after Franken flew into Grand Forks to spend two days talking to locked-out American Crystal Sugar Co. workers in the Red River Valley. Mark Froemke has also lobbied Minnesota’s senior Senator Amy Klobuchar. 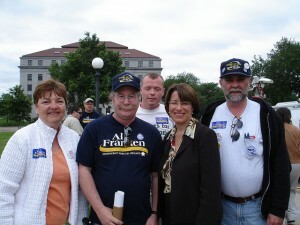 Minnesotan labor activists were well-represented at the June 25, 2009, Washington DC rally for health care reform. Among the union members urging Sen. Amy Klobuchar, Rep. Tim Walz and Rep. Collin Peterson to support health care reform that will “offer quality affordable health care to America now” were: Linda Slattengren, president of MNA, Laura Askelin, president of SE MN ALC, and Mark Froemke, president of the Western Minnesota ALC. Below is a photo taken July 1, 2009, at an Al Franken Rally in Minnesota. Standing behind Amy Klobuchar’s left shoulder is Mark Froemke. His wife LaVonne Froemke, is the other woman in the photo. Mark Froemke is also very close to Minnesota’s far left governor Mark Dayton. The time is now. We have an opportunity to build a Better Minnesota by electing Mark Dayton as Governor and all our other labor-endorsed candidates. But, we need your help. That’s why on Saturday, October 23, we’re kicking off 10 Days of Labor Action. During the 2010 elections, Mark Froemke helped to organize a breakfast meeting for gubernatorial candidate Dayton. Anyone who has ever worked a campaign knows that the days start early and end very late. Today was no exception. Dana Anderson, our campaign manager and of course gubernatorial candidate Mark Dayton, and I hit the road at 7:30 am for a week of talking to voters, working families and business owners – all of which are vital to helping our economy recover. A special thank you to Mark Froemke for helping to organize a breakfast with members of Bakery, Confectionery, Tobacco Workers and Grain Millers Local 167G. We had a great conversation, and we really appreciate Mark’s help in putting this event together. 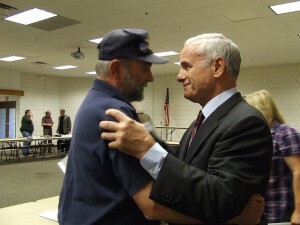 Mark Dayton, gives some love to Mark Froemke, January 14, 2010. 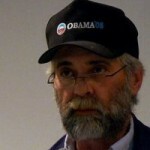 Mark Froemke, in common with most of his Communist Party comrades, is a huge fan of Barack Obama. Maybe some of Minnesota’s leading politicians should be asked to explain their ties to leading Communist Party member Mark Froemke?